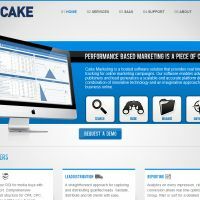 Cake Marketing Affiliate software is a hosted software solution that provides its users with all of the information and analysis they need to be successful in affiliate marketing. Although not a perfect solution, we were pretty impressed by how polished everything on offer with this package was, so it’s definitely worth checking out if you’re looking to inject some life into your affiliate program. With a range of great features including performance management tools, excellent tracking methods and efficient analytics tools, users have everything they need to generate sales and boost revenue. All in all, with Cake Marketing on board, making a success of your affiliate program is, well, a piece of cake. Sorry, we couldn’t resist! One of the best aspects of Cake Marketing Affiliate software is cookieless tracking, a more accurate way to track a user's journey through the internet. This means it’s easier to track leads and sales, which in turn means lost sales are reduced and affiliates are more satisfied (as their hard work will never go unrewarded). A wide range of campaign management tools allow managers to ensure performance, while the navigation bar lets users add notes, contacts, documents, assignments or tasks to the online interface (or direct them to specific affiliates), improving communication. Similarly, pop-up info cards help you group and display information and relevant content together, making it easier to manipulate. With so many high quality features on offer, it’s easy to see why Cake Marketing is so popular with affiliate marketers of all levels of experience. Unlike other services we have reviewed in this category, the cost of employing the services of Cake Marketing Affiliate software is on a ‘by application’ basis. This means there is no way of effectively comparing the cost of this service with that of others, in light of the features and tools on offer, in order to effectively compare whether this service represents good value for money. Although Cake Marketing professes to match other similar services in the market that offer tools of comparative quality, it’s probably a good idea to check out what’s on offer elsewhere in our listings in this category (as well as getting a quote from Cake Marketing as to the cost of the service for your organization) to check you’re getting the best deal. Cake Marketing Affiliate software just makes it into our top ten in this category, providing users with a good overall service and a range of handy features and tools that will make even the most difficult of tasks related to affiliate management more straightforward. Although many of the tools on offer as part of this software are far from unique, they are executed well and appear to be of good quality. If you’re interested in giving Cake Marketing a try, hit the link below to find out more about the software. If not, check out our other reviews in this category for in-depth information and analysis of alternative services in this market.